What is the Transpose of these Matrices ?? Here Given matrix have 3 rows and 4 columns .It means we shall have 4 rows and 3 columns in transpose matrix. so shifting the corresponding Rows into Corresponding columns. We can check that same colour rows are transformed to same colour columns. Now we shall take one more example to find the transpose of matrix .Here Given matrix have 3 rows and 4 columns,It means we shall have 4 rows and 3 columns in transpose of that matrix. so shifting the corresponding Rows into Corresponding columns. We can that check same colour rows are transformed to same colour column. Let us take more example to find out the transpose of matrices. 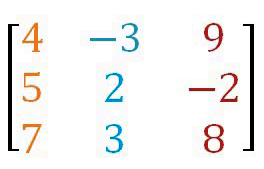 These are two examples , both of which are of 3×3 orders. Hence the transpose of these matrices will be again 3×3. 1st consider matrix G , after transforming its 1st row into column , the 1st column of the transpose matrix of G ' will be -2, -5, 4. 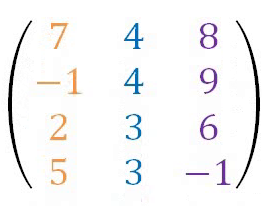 After transforming its 2nd row into column , the 2nd column of the transpose matrix of G ' will be -5, 7 , 3. And after transforming its 3rd row into column , the 3rd column of the transpose matrix of G ' will be 4, 3, 8. If we write the transpose of matrix G then we can see that there is no difference between the matrix G and the transpose of the matrix G.
Now consider matrix H , after transforming its 1st row into column , the 1st column of the transpose matrix of G ' will be 2, 3, 4. After transforming its 2nd row into column , the 2nd column of the transpose matrix of H ' will be 3, 5 , 6. And after transforming its 3rd row into column , the 3rd column of the transpose matrix of H ' will be 4, 6, 7. Again in the case of matrix H , Matrix H and its Transpose matrix H ' are same. Such Matrices are called Symmetric Matrices. then A¹ = - A , Such Matrices are called Skew Matrices.